AB 320 G | SFS Associates, Inc. The precision bandknife splitting machine AB 320 G is used in the rubber, plastics, cable, and textile floor covering industry as a laboratory machine. As a special feature, the machines in the G-Series have a display which indicated the set distance between the bottom feed roll and the cutting edge of the bandknife. So the desired cut level can be realized in the first splitting process. AB 320 G with LCD display of splitting thickness, and scrap thickness, permanent display of key machine management features, with thickness measuring device. 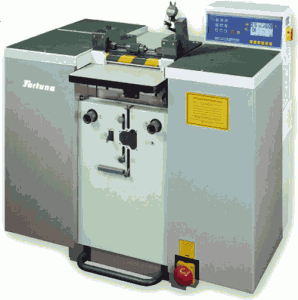 The standard version of the machine has a clearance of 8mm material thickness (optional 20 mm). The automatically self-adjusting band-knife ensures a constant position of knife edge. This position can bechecked by integrated magnifying glassed.